DJ Static and Professor Groove began broadcasting WEFUNK to Montreal in 1996. The studio and airwaves of CKUT (McGill University) have been WEFUNK's home throughout our two decades on the air. After about 18 months doing late-night sessions, the show settled into Friday night party hours — midnight to 2am — in January 1998. Early in 1999 we began webcasting and archiving our shows online, and the world got their taste of the WEFUNK sound. iTunes started syndicating our radio stream in 2001, giving WEFUNK a lot more worldwide exposure. Since then we've been doin' our thing, searching out new grooves to make you move, recording hundreds more weekly shows and building up the website. Montreal's still bumping WEFUNK every Friday night on CKUT, and you can catch us 24/7 here on wefunkradio.com. WEFUNK celebrates a lineage of powerful, inspired music. The roots of soul, funk and rapping go back way further than the 70s, but something special began when James Brown gave the drummer some, Larry Graham hit the bass harder, Kool Herc gave the dancers breaks, DJ Hollywood worked the mic... and musicians worldwide found the funk seeping through their walls and into their music. Strong music gave a strong foundation to speak on social problems, relationships, politics and living conditions. And it made one hell of a party groove. 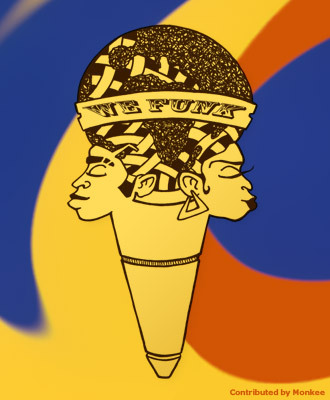 Funk gave birth to hip-hop, and as the past grew into the present funk and hip-hop touched every modern music, leaving their mark—a swagger, a groove, mo' bounce... and something to twist your face and nod your head to. You know it when you hear it. And we play it on WEFUNK.